In the middle of the night in late January, 2016, two women snuck into a puppy mill in a remote area of New South Wales, Australia. 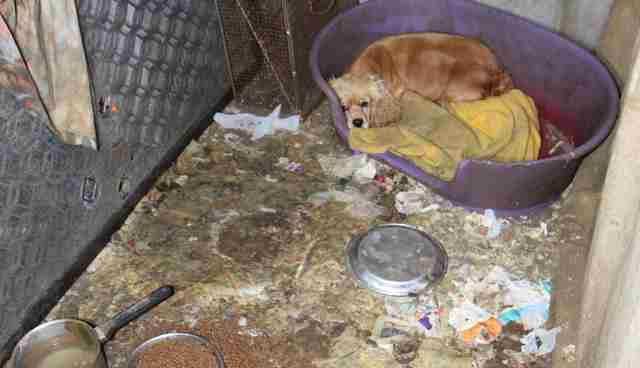 Debra Tranter and her co-investigator had visited this same puppy farm in 2015 to find dogs living in squalor. Mother dogs at the site were in poor health as they were forced to pump out endless litters. 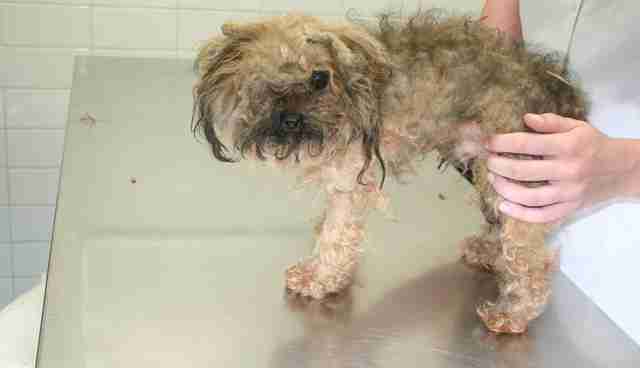 Tranter, founder of the Australian anti-puppy mill group Oscar's Law, documented these horrible conditions and handed the evidence to the RSPCA. The footage prompted authorities to seize 16 dogs in urgent need of veterinary care, and to issue the puppy mill operators a notice to comply with animal welfare standards. But when Tranter and her colleague arrived at the puppy mill for the second time, they found that things had actually gotten worse. 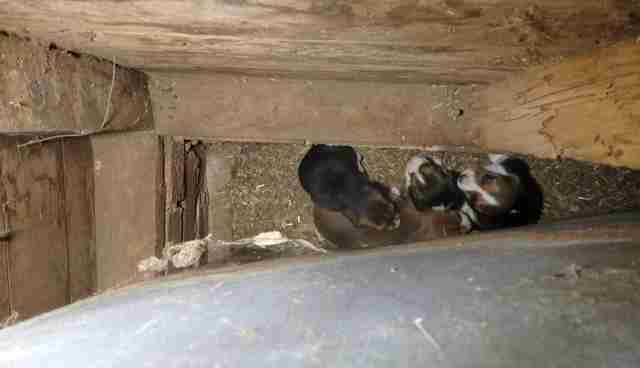 Inside a dilapidated shed, dogs were crammed into rat-infested pens with dirt floors and no bedding, Tranter said. She could see that the dogs had been chewing on the wood and wires of their cages out of boredom and frustration. The only water available was filthy and covered in green slime, and the entire place stank of urine and feces. When one dog barked, the others joined in, creating a deafening cacophony of sound. One dog in particular caught Tranter's attention. 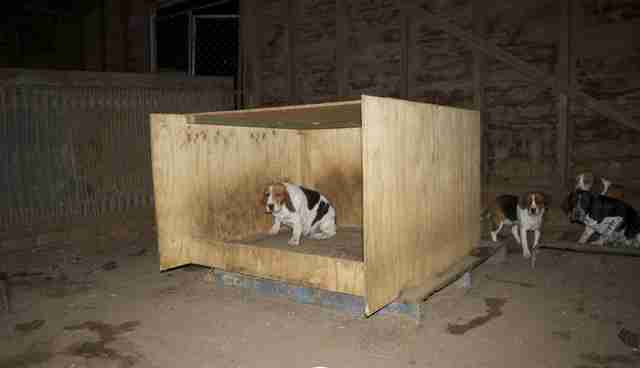 A female beagle cowered in the corner of her filthy enclosure and stared at Tranter with wide, suspicious eyes. Tranter stooped down to film the female dog, then turned to leave the area. That's when Tranter heard a puppy cry. "I immediately spun around and thought, where could puppies be?" she told The Dodo. "There was nothing in the pen except for a big wooden box. I knelt down and looked underneath that box, thinking it was the only place where dogs could be. But there was nothing." Tranter turned her video camera light off and sat on the ground to listen. When she heard the cry again, she started crawling around the pen until she noticed a piece of plaster loose on the wall. Tranter turned her camera light back on and shined it through the gap. 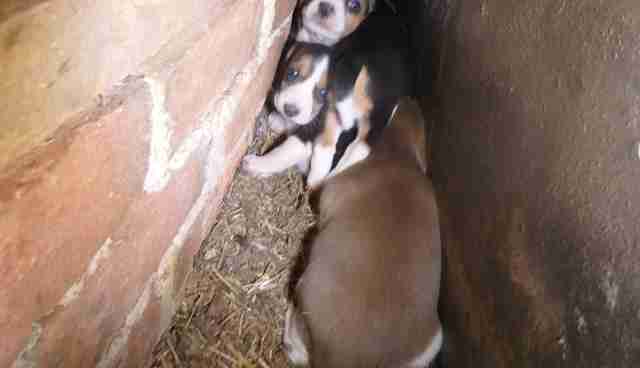 There, inside the wall cavity, she discovered four wriggling beagle puppies squashed into the tiny space. "It was incredibly sad," Tranter said. "This poor mother dog had to give birth on this filthy dirt floor, and had nowhere safe to put her puppies. She was surrounded by all these other barking dogs, so the mother had hidden her babies within the wall cavity because it was the only safe place." Unfortunately, puppy mills are legal in the state of New South Wales in Australia - as they are in the U.S. and many other places in the world. While the New South Wales government has outlined animal welfare regulations, there is little or no enforcement. Not only that, but many puppy mills - like the one Tranter investigated - operate without a license. "They start up in these remote, rural areas," she explained. "No one knows that they're there until someone hears some noise and makes a complaint." 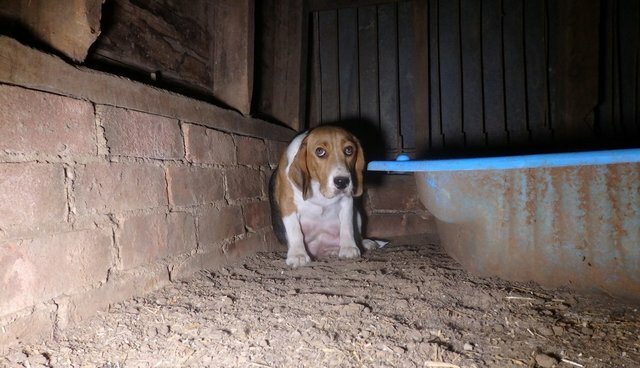 Tranter estimates that there are approximately 200 puppy farms in New South Wales, which produce thousands of animals each year. Puppies are sold in pet stores and online shops for prices up to $2,000 per dog. Buyers are often told the dogs have been hand-raised in family homes, but nothing could be further from the truth. Dogs from puppy mills are riddled with health problems and tend to be psychologically traumatized after living in miserable conditions. In some cases, puppies die shortly after being purchased by their new owners, which is what happened to an English staffy named "Torro" in Western Australia, who died from bronchopneumonia nine days after being bought from a pet store. The puppy mill situation in the U.S. isn't much different. According to Last Chance for Animals, puppy mills need to be licensed by the U.S. Department of Agriculture (USDA), but the industry is poorly regulated. When puppy mill operators are found to be violating the animal cruelty laws, they can still remain open while they "remedy" their issues. Right now, there are thousands of puppy mills in the U.S., producing over two million puppies each year. This is a scary thought when you think about the nearly three million animals euthanized each year, according to the ASPCA. Yet Tranter is optimistic that things will change. In the Australian state of Victoria, profit-driven puppy mills are soon to be outlawed, and laws are expected to pass that will ban the sale of animals in pet shops. Tranter hopes the New South Wales government will pass similar legislation. After discovering the beagle puppies in the wall cavity, Tranter had to make the heartbreaking decision to leave both the puppies and their mother behind so she wouldn't be charged with theft. 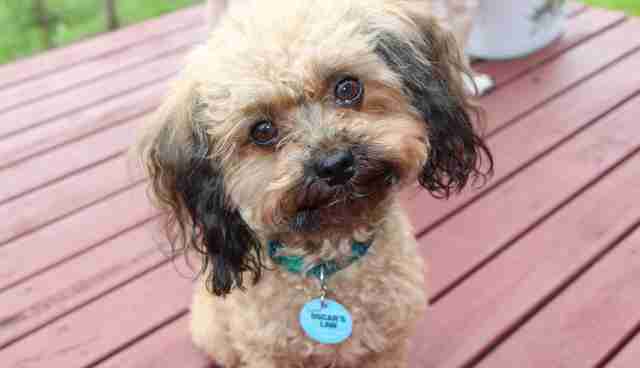 Yet Tranter is confident her photographs and videos will save these dogs' lives. "In my opinion, conditions were so bad, there were grounds to close the place down and get these dogs out," Tranter said. "That's what I was pinning my hopes on." If the dogs can be legally rescued by the authorities, Oscar's Law has offered to pay for all veterinary bills and help find foster homes for the animals. Still, the dogs will have a long road to recovery. When Tranter rescued her miniature poodle, Oscar, from a puppy mill in Victoria, she said it took him many years to adjust to his new life. "At first, he was terrified of everything, like the phone ringing, or the TV or the toilet flushing," Tranter said. "He had never been picked up or patted or walked or anything. He was a trembling little ball of mess." Tranter spent many months carrying Oscar in her arms, where he felt safe and secure. Then, little by little, she started introducing Oscar to people and taking him for short walks outside. "As of today, he still has separation anxiety from me," Tranter said. "If he can't see me, he panics. But as long as he can see me, and he's with me, he's very confident." Sign this petition to shut down puppy mills in New South Wales, and help save the lives of over 400 dogs. Always adopt from an animal shelter or rescue group instead of buying a dog from a pet store. Please ask your elected officials to outlaw puppy mills in your state, and demand that the USDA enforce the Animal Welfare Act.